The McGill radar group operates several instruments in various locations to study weather. Each is different enough from the others that they provide complementary information. In the Macdonald campus, 30 km west of downtown Montreal, is the J.S. Marshall Radar Observatory itself where the main radar facility is located. It consists of a dual-wavelength, dual-polarization, Doppler scanning radar system. With its 9 m antenna sitting on top of a tower, it is one of the most sophisticated weather radar in the world. The first element of the system is a dual-polarization, Doppler, long wavelength (S-band) radar which measures the intensity, the velocity, and the shape of weather targets (rain, snow, hail, etc.) up to a range of 250 km. It is complemented by a shorter wavelength (X-band) radar and two additional receivers located elsewhere which help us obtain a more complete picture of the weather. 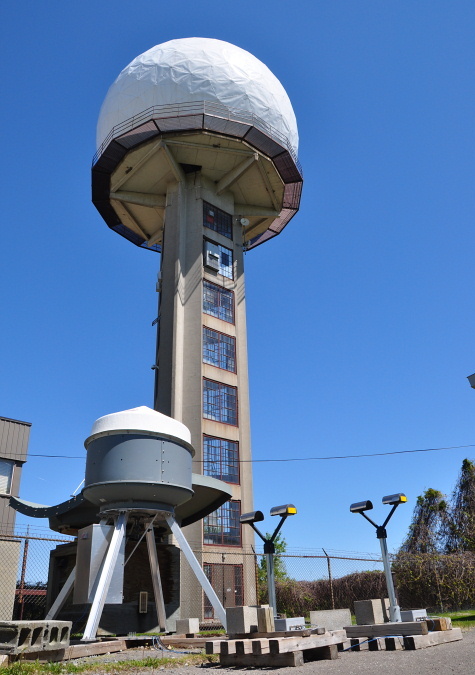 This radar is used 24 hours a day to monitor the storms around Montreal. After the radar signals have been processed and interpreted, the data are sent to the weather office and the downtown campus where they are made available on the web in real-time. Two other radars are located in Ste-Anne de Bellevue. One is a VHF profiler (not shown), while the other is an X-band vertically pointing radar (known as a VertiX). The VHF profiler allows us to get winds under all weather conditions throughout the troposphere while VertiX is a research radar used primarily to study the formation of precipitation. In addition, we have support instruments to image raindrops or snowflakes and determine their size distribution. In the downtown campus, on the roof of the departmental building, we have more instruments. One is a UHF wind profiler, an instrument designed to measure the evolution of wind direction and velocity throughout the lower atmosphere. The profiler is also equipped with a radio-acoustic sounding system (RASS) which allows it to be used to measure temperature with height. Next to the profiler is a ceilometer, a laser-based instrument designed to measure the height of cloud bases but which can also be used to look at pollution from dust. We then have two other vertically pointing radars (one VertiX, and a Micro Rain Radar on loan from Health Canada). Finally, we have a set of additional support instruments which include a radar-based precipitation type detector known as a POSS and a distrometer (to measure the distribution of drop sizes).